On February 9 to 18 Latvian boat and flagpole factory Amberlat will take part in the international exhibition ”Vene 18 Bat”, held in Helsinki, the capital of Finland. Representatives of the company will look for new opportunities for cooperation with potential partners, as well as will present to the wider public the boat AMBER 430 PRO FISHING, an original and innovative product created in Latvia. During the exhibition, Amberlat is going to invite other industry representatives to cooperation, introducing to them the professional angler boat presented in the exhibition and sharing the innovative ideas and new design opportunities. One of the main trends Amberlat will focus on in cooperation opportunities is its ability to produce really high quality and innovative products, both individually and in cooperation with potential traders. Amberlat is currently No. 1 among the largest registered boat manufacturers in Latvia. For ten years, the company has been manufacturing fiberglass boats, investing resources in innovation and creating new models every year. The boat is traditionally made in the form of trimerane design, which is the most stable of possible boat designs, but among the most popular range of products is also single-keel rowing boats, moderate angle keel boats, single and double hull boats, canoes, rowing boats, motor boats and industrial fishing boats. Boat designs are created in cooperation with industry professionals, sailors, fishermen, holiday makers. Each year, in cooperation with them, at least one new boat model is created. At present, Amberlat has got 18 boat models and currently there are two more in the process of developing the prototype. In this type of exhibition Amberlat will take part for the first time, and according to Ilze Serzane, “Zimes” Ltd board member and export director – participation in the exhibition will be one of the company’s most outstanding events this year. “Amberlat has already proven itself well enough in the Latvian market and it’s time to see what new horizons are opening to us. The exhibition is a great opportunity to start long term and close partnership with partners from around the world. It is also an opportunity to present our products to the world, emphasizing their quality, advantages and unique solutions”, points out I. Serzane looking forward to cooperation with international distributors. 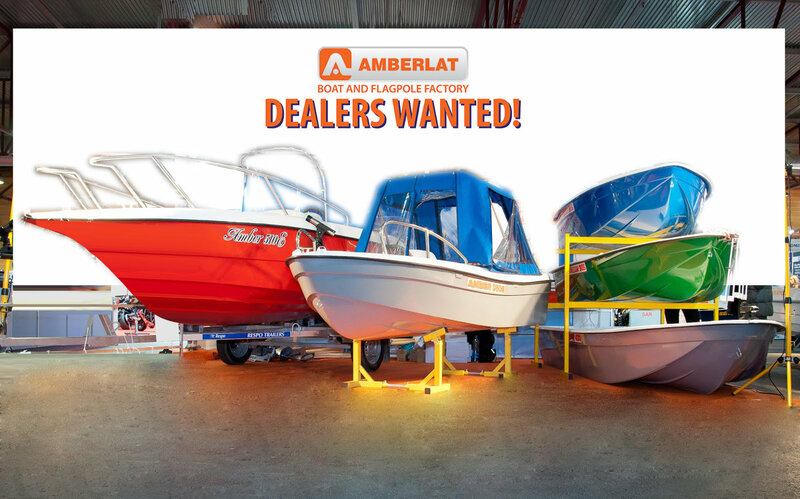 So far, Amberlat has partnered with boat dealers in Estonia, Lithuania, Sweden, Russia and Norway, and expects to extend its range of partners, offering both – trading of the designs developed by the company and creating completely new designs with their partners. During the exhibition Amberlat will also present its AMBER 430 PRO FISHING boat, which is an improved version of the classic rowing boat available in Scandinavia. Unlike those, AMBER 430 PRO FISHING has come up with a unique solution that emphasizes product stability and quality. Amberlat believes that this is a great opportunity to establish co-operation with the leading boat traders in the world and at the same time show itself as a competitive company that follows innovations and newest technologies, introducing them into their own products. For more information on Amberlat, call +37127831364 or visit www.amberlat.lv . In end of August with Amberlat contacted Riga 1.st Special boarding school with a beautiful desire - despite the fact that the school is located in the heart of Riga - in Martas Street - they really wanted in their small yard to install the flagpole. Amberlat was very touched about a possibility to realize such project. It was made in non-standard size (height 3,5m) flagpole, presented to the school and installed in non-standard place - school entrance on the covering canopy roof. Good job- flagpole for psychological rehabilitation center "Dūjas"
In early summer, seeing the TV spots about Jekabpils district Kalna Parish Birzi forestry building restoration and conversion to Martin Foundation psychological rehabilitation center "Dūjas", we were clear that all that is lacking for such a charming courtyard is a flagpole, which Amberlat in Augustgifted and installed in August. From to Martin Fund psychological rehabilitation center "Dūjas" later we received a wonderful thank-article. On 28th May in Lilaste lake there was annual angling competition "Fishermans for charity" (trans. from Latvian). All funds that was raised in competition was for association "Latvian children with disabilities" summer rehabilitation program project "Dream Workshop" that gave 10 day ticket for each of 50 kids. To be able to reach maximum number of anglers Amberlat boat and flagpole factory donated boar Amber 315 as a gift for 1st place.